A dark wood wardrobe can so much character to a room! It can look mature, modern or classic. Whatever style is desired in a room, a dark wood wardrobe can help. With its rich colour, it can become a statement piece of the room. These cool dark wood wardrobes are great inspiration for those who want to walk over to the dark side… of high fashion design. 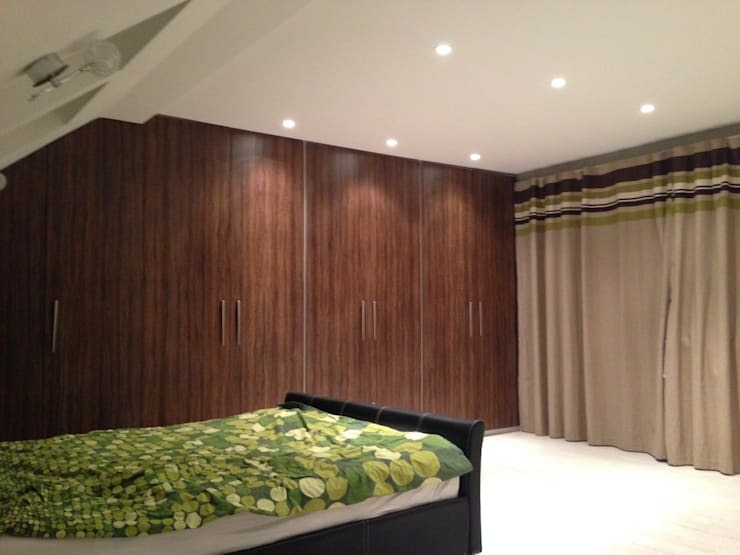 Add a dark wood wardrobe to finish off an elegant bedroom as this designer chose to do. This wardrobe brings in an elegance on its own. It is made from a rich, dark wood that has a gorgeous design. The design is carved into the wood and looks very royal and elegant. It looks more like the statement piece of the room instead of just an accessory. This is a great dark wood wardrobe for those looking for elegant detail in their bedroom. 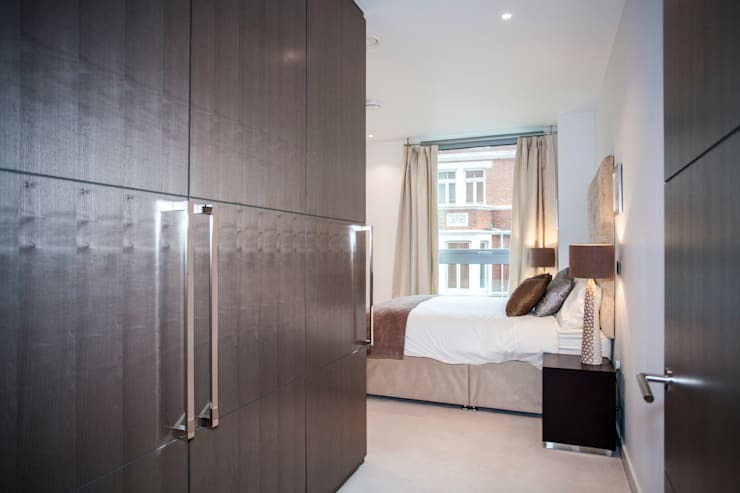 Looking to create the ultimate dressing room with multiple wardrobes? 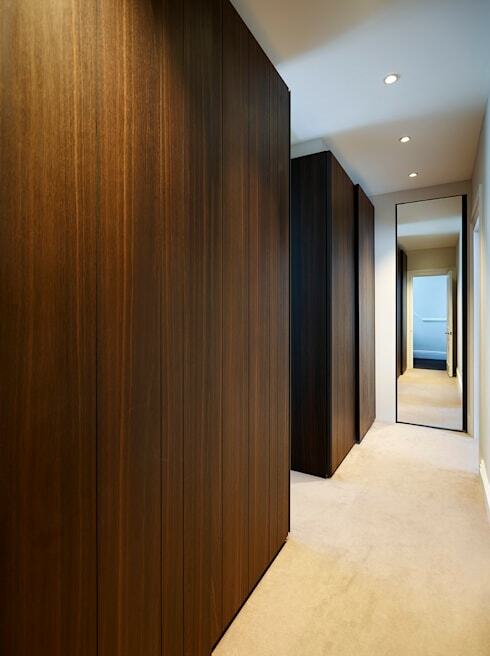 Implement dark wood wardrobes to create a rich, grand look. These wardrobes are sleek and modern. The colour is a super dark chocolate brown wood that feel and looks like luxury. The wardrobes have sharp lines and edges, which gives it a clean, modern look. This is the perfect wardrobe to use for creating the ultimate fantasy dressing room. This dark wood wardrobe is traditional in style, which fits perfectly with the style of the bedroom. The wardrobe opens with two doors that have a small, round knob sat pits handle. 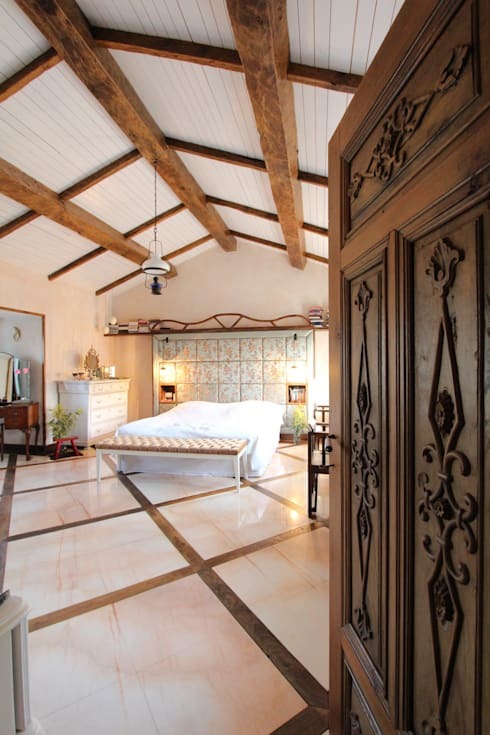 There is light carving in the wood, that creates style and gives it the classic and traditional look. This is a great piece for those who want an effortlessly stylish and timeless look in their bedroom. The finish on this dark wood wardrobe gives it a unique and dramatic look. The wardrobe is a rich brown colour that looks like it is water stained. This creates a cool pattern and texture, which overall makes this wardrobe very unique. The wardrobe is placed against a white wall and floor, which makes it pop even more with its rich colour. 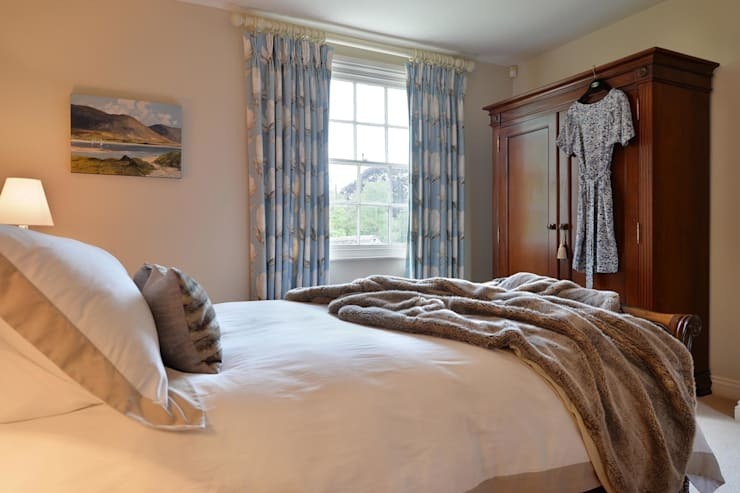 The wardrobe is not too overpowering, instead it works with the room to create a clean, fresh look. 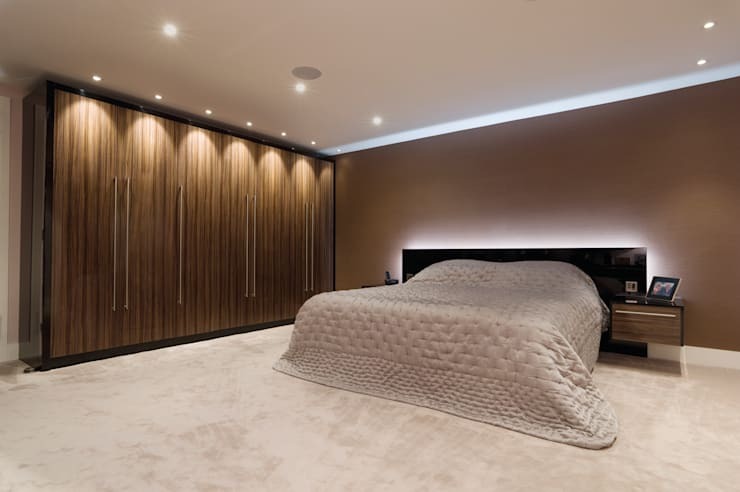 These spotlights are definetly shining on the most eye catching piece of furniture in this bedroom-the cool dark wood wardrobe. The wardrobe is a medium dark brown colour and has a texture that allows other shades of brown to peek in. These creates a more artistic look. The handle bars are also unique. They are ultra long, slim vertical bars that create a stylish look in themselves. 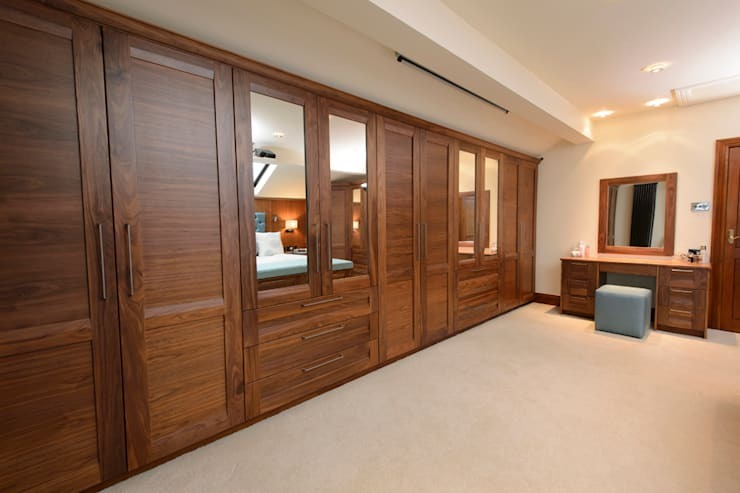 The end result is a gorgeous dark wood wardrobe that is the statement piece of this bedroom. This dark wood wardrobe comes in a set of three, creating triple the design. The wardrobe is grand as it reaches the ceiling. The shade of brown is a lovely, deep colour that has hints of other shades and so has good texture and pops more with design. The door handles are slim, almost blending in with the wood, which gives it a modern and minimalist look. While the wardrobe is grand it doesn't feel overwhelming. Instead, this wall of wardrobes looks like a great focal point for the bedroom, bringing in great style and function. Going for an eclectic look? Try this cool dark wood wardrobe. The wardrobe is grand in size as it takes up an entire wall length and it reaches the ceiling. The wardrobe is made of patterned wood, which is truly unique. The wood in a way looks like mosaic tiles. There are many large squares that each have a different wood pattern on them. As a whole, the wardrobe looks textured, which is a really cool look for this bedroom. Finally the doors open with slender, vertical wooden bars, completing this really eclectic look. This cool dark wood wardrobe is truly a statement piece in this room. The colour is a super dark, chocolate brown which stands out as bold and mature in this bedroom. The wardrobe takes up the length and height of the wall, packing much style impact. The re are carvings on the wardrobe, which brings in the high fashion style. The carvings are intricate lines, giving the wardrobe a texture. 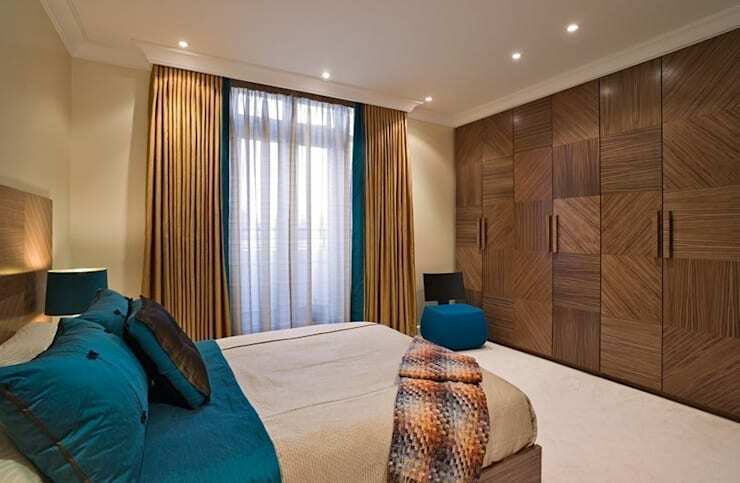 This wardrobe looks like a piece of art, it definetly is the wow factor in this bedroom. 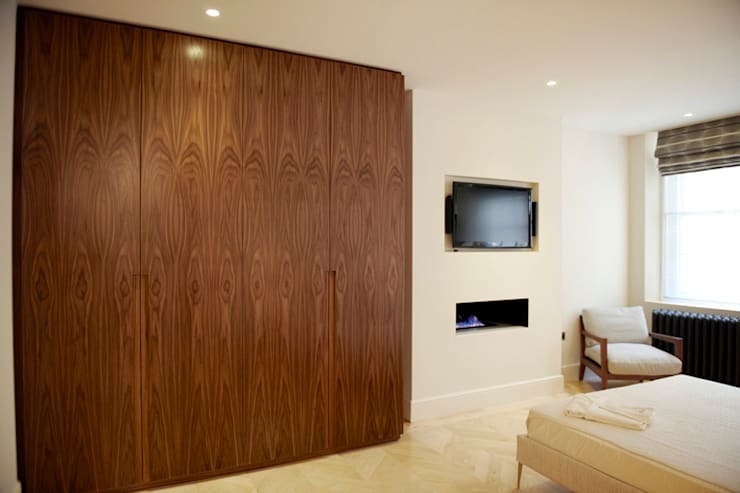 This dark wood wardrobe fits perfectly in a modern and sleek design scheme. The wardrobe is s deep, chocolate brown, which goes perfectly with the rest of the decor of the bedroom. The handle bars are sleek, silver vertical bars which adds so much modernity to the piece. The rest of the wardrobe is smooth, with sharp lines and design, which also gives it a minimalist feel. The silver finishes also compliment the silver finishes that are found throughout the room, completing a very modern and sleek bedroom look. This cool dark wood wardrobe is high in function and style, just as a wardrobe should be. The wardrobe is a rich brown colour. There is a great texture in the wood as hints of other shades peek in. The wardrobe features classic cabinets as well as mirrored cabinets and drawers. It takes up the entire wall. It is surely eye catching and is the perfect wardrobe for those needing much storage and don't want to compromise style. Do you have a favourite dark wood wardrobe style? Let us know!